Do you know about Pinkberry? I have been waiting years for Pinkberry (thanks to my love of all things celebrity). The low calorie frozen yogurt started back in 2005 in California and I have been patiently waiting for one here in RI ever since. I remember reading about it for the first time in US Magazine and wanting some then. Finding out a few months ago a store would be opening in RI left me ecstatic. 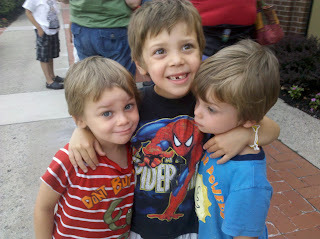 After the boys ran their races they were treated to some Pinkberry and loved it. What I loved the most was how healthy the choices were. I will totally admit that while I still refuse to let my kids have soda, I still take them through the MickeyD's drivethru and get them vanilla hot fudge sundaes here and there. I don't even want to think about what goes into them when I take them to the Creamery or somewhere else and they get their ice cream all loaded up with whipped cream, candy, hot fudge and more. What kid wouldn't choose all that? Staring at toppings of fresh fruit though the boys were still excited and I loved watching them make the healthier choices - and love what they were eating. Last night Pinkberry opened their store in Garden City and my husband and I took the boys. A little rain sure was not going to deter them. The line grew long behind us but we did not end up waiting very long. I would say we were in and served within 20 minutes. 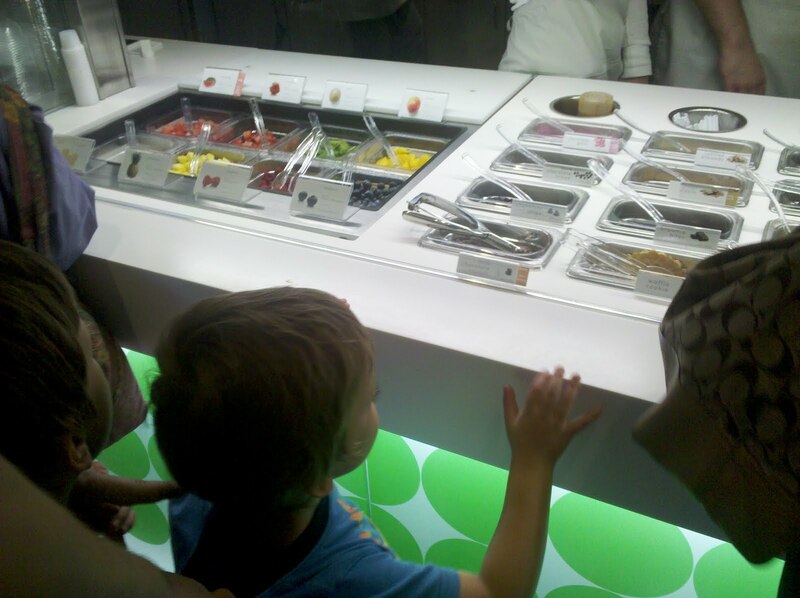 Loved watching the boys eyes light up with all the fresh fruit options as they ordered and was pleasantly surprised they all chose a fruit topping without being prompted. Not being able to help myself after seeing the media tent across the street, I sat the boys down with my husband to eat and pulled out some business cards from my pocketbook and headed over. I figured it was worth a try (which I keep saying is so not me - and it's not - but maybe it's a new part of me). I spoke to 3 different people who were not quite sure what to do with me since I was not on the list before being sent over to a wonderful man who was running the whole show. 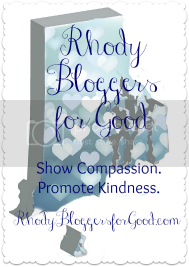 I handed him my card and explained I was a local blogger and wondered if I could get any PR info to include in my post. He welcomed me in, spoke with me for several minutes and apologized for missing me. He had reached out to several area bloggers and put me right on the list to come in with my husband and boys. 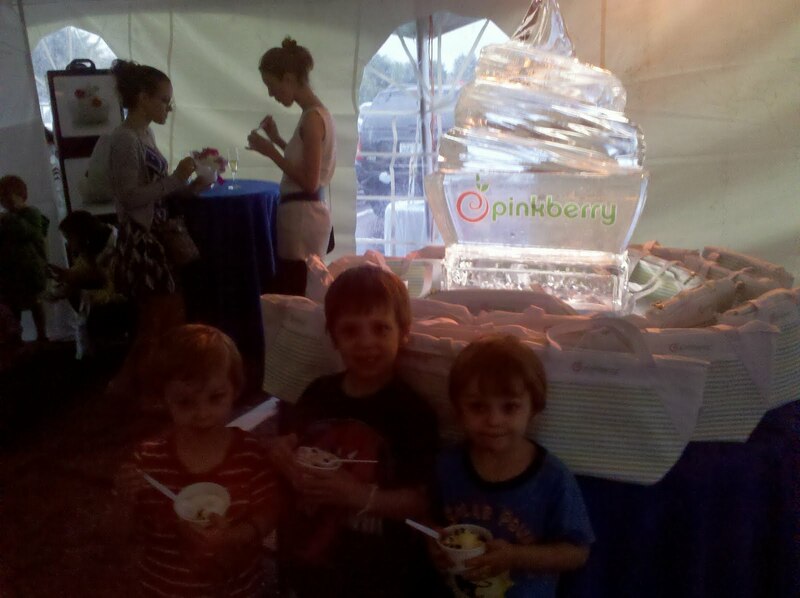 Returning to the tent the boys were beyond excited to get more Pinkberry and were completely in awe of the ice sculpture. The boys tried the original, salted caramel, coconut, mango and watermelon flavors. What's better than Pinkberry for dinner! Watermelon by far was their favorite, though they seemed to love them all. The best part of the night? 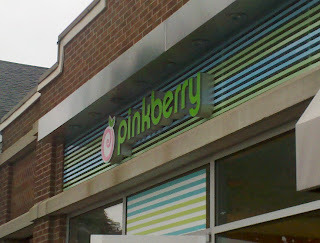 I get to host an upcoming lunch at Pinkberry for some of my girlfriends and blogger friends!!! (Date and details to be announced.) How much does that rock?! is also a relaxing and enjoyable solution to use. Naomi makes her living on her looks so losing her hair is no small thing. cold laser therapy is now used for the treatment of hair regrowth.